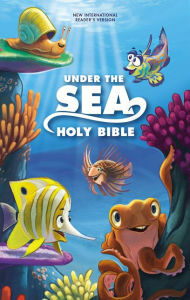 Any child that loves the Ocean theme or the popular movie, Finding Nemo, will love to receive this new Under The Sea Holy Bible New International Readers Version (NIrV) bible. The beautiful and vibrant cover featuring vibrant sea creatures with bright smiles will certainly draw in young children and kids of all ages to open the cover to take a peek. Inside this bible are colorful themed inserts as well, to introduce children to basic bible concepts such as the books of the bible and the Ten Commandments. A quick peek as this beautifully designed bible is certain to impress any parent or gift giver. While I was impressed at the beautifully designed cover, I was underwhelmed after I actually took a look inside. Once you open the bible, you will find a pretty standard pew-like bible with its tiny black print on standard white pages. Lacking any graphics, and with its space saving small font, this is enough to detract from the readability of the bible, which is a large drawback for a bible marketed for young readers. Although I was greatly impressed by the cover and the color insert pages, I would pass this bible up as I can not picture any young reader actually wanting to read the text of this bible. I am left puzzled and perplexed at why the publishers chose to use such a tiny sized font and as to why there was no spot color or graphics included within the text. In the end I was disappointed with this particular bible when considering all the other choices of full text children's bible which include accent colors and graphics. I feel the publishers could have integrated the aquatic theme throughout the bible. I do not feel enough was done with this bible to make it unique or easy for a young child to read. Although I love the fact that this is the NIrV version, young readers will struggle to trudge through this bible due to the super tiny font and the lack of graphics or art to break up the large chunks of monotonous text. As a blogger I received a copy of this bible published by Zondervan for the purpose of writing this review.